Craft Shows in Massachusetts 2019–2020. A Spring-time festival that celebrates Milford's rich history and vibrant community. Join us and the approximately 12,000 attendees of this event for a wonderful day of fun. Over 100 Juried Craftspeople will display and sell their American made works at the Brewster Summer Arts and Craft Festival, held at Drummer Boy Park on Route 6A, in Brewster, MA. Free Admission and held rain or shine. Gloucester Harbor will blossom into the colorful 39th annual Gloucester Waterfront Festival. Featuring 250 Booths of American made arts, crafts, food and live music. Pancake breakfast, Lobster bake and Antique Car Show complete this picture perfect New England event. Hours are Saturday 10am-6pm and Sunday 10am-5pm..
Over 100 Juried Artisans will display and sell their American made works; including Fine Jewelry, Quilts, Pottery, Candles, Floral Arrangements, Hair Accessories, Home Décor, Personal Care, Sports Team Apparel, Sea Glass Jewelry, Shell Crafts, Fiber Art, Doll Clothes, Table Runners, Nautical Décor, Original Paintings, Fused Glass, Painted Doormats, Landscape Photography, Etchings, Stoneware, Watercolors, Metal Mobiles, Pet Gifts and much more. The 9th annual craft festival seeks New England craft artists making original work. It's a two-day outdoor show featuring the work of 40+ juried artists set on the picturesque grounds at Fruitlands Museum. The show's quality of craft, entertainment, museum offerings, and stunning views makes it a popular September destination. Submit an application to Harriet Friedrich or visit Fruitlands Museum website for more information. The Arena at the Topsfield Fairgrounds, in Topsfield Massachusetts will host the New England Craft and Specialty Food Fair. 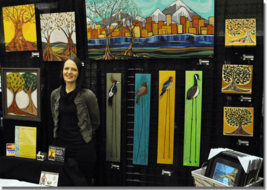 Over 250 Booths of juried American made arts, crafts, specialty foods and live music. Indoor rain, snow or shine. Ample free parking. Admission $8.00, under 14 free. One admission is good of all 3 days! A New England Tradition continues, the Original Castleberry Faire takes place at the Shriner's Auditorium in Wilmington, MA over Thanksgiving Weekend.. Over 250 booths overflowing with American-made arts, crafts, specialty food sampling and live holiday music. Directions: From Route 93 take Exit 39. Admission $8.00 Adult, under 14 free. One Admission is good for all 3 days.